What port size for an RSS210HO-8? Tuned the box to 25.15hz. With a 2"x2" square port with flared ends(3/4 roundover bit on the plywood), the length is reasonable at 10.68" considering the depth chosen is 14". I'm just worried about vent noise. On one hand it's only 8", but it does have 12mm of xmax. Look at the port velocity at full power in your software model. You'd want it no higher than 20 meters/second. I've seen 8" NON-subs (limited Xmax) chuff with 3"id ports (w/out a roundover at the exit). 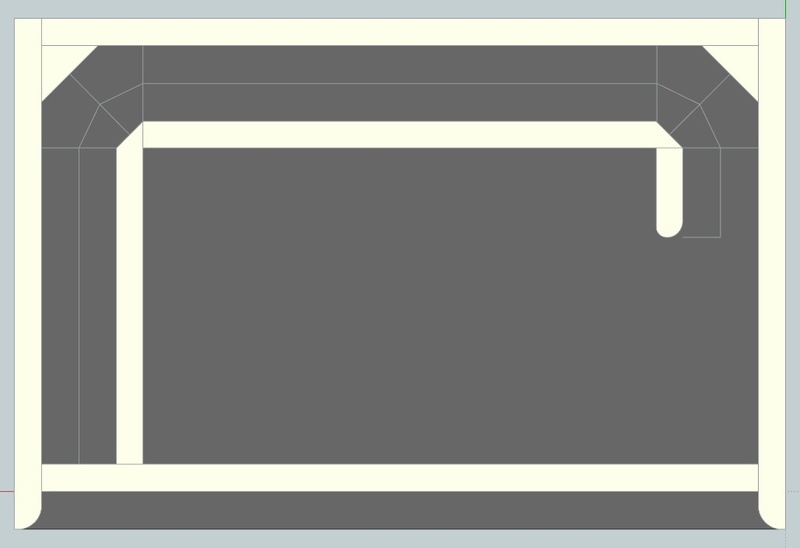 2 alternatives would be a slot vent, or a passive radiator (which'll most likely need to be 10" or larger). Chris, Bill, thanks so much. At RMS, port air speed was absolutely insane. 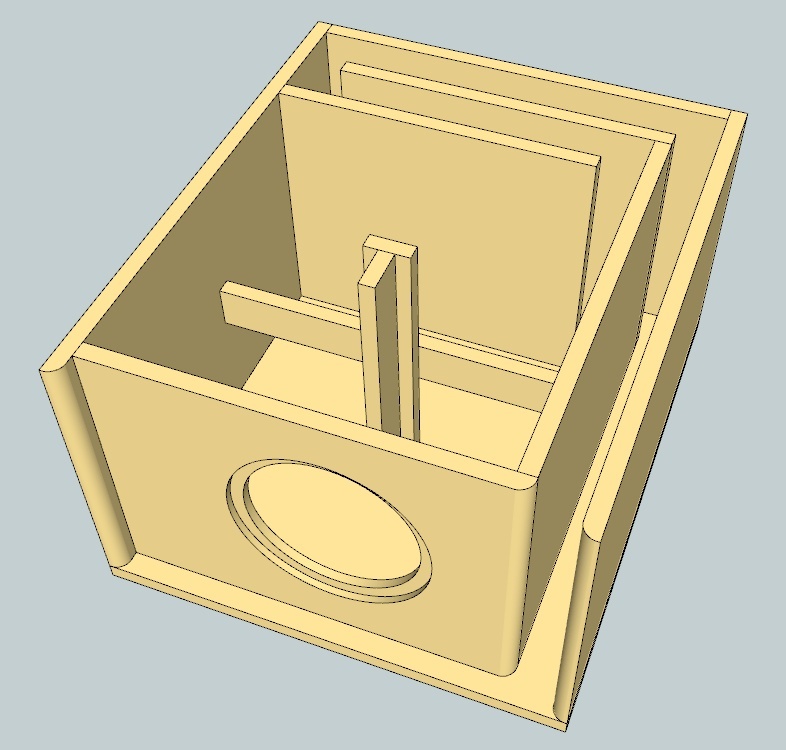 I redesigned the box for a large slot as Chris suggested. I went with a 1.85" x 12.5" port, snaked 56" port through the box. Now I have 22-ish meters / s at peak power, 17ish at RMS power. Are there problems with ports that long? And am I measuring them correctly? Should I need to brace this? I'm using .7" pine ply that's I would say medium to high quality, for pine. 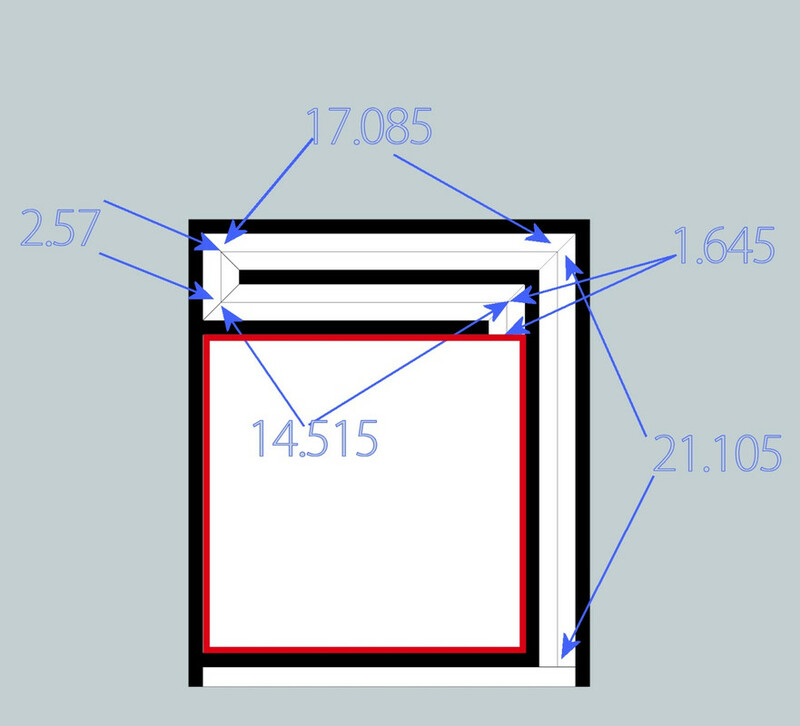 The interior is roughly 16.3 x 16.3 x 12.5. Also the log-out timer on this site is set to like a minute, which is worse than my bank! Holy crap! Reality check: you'll never put peak power into it. You're not likely to even put the full 300 watts RMS into it. It's reasonable to assume that you'll run it with at least 3dB of headroom, so cut power to 150w. That should allow you to use a smaller port area, and a shorter port. Also don't forget that the box volume is net, less the volume taken up by the port, so there's a point where Fb is better served by not making the port volume too large. What Bill said. Also, "pipe resonances" from the use of long vents can result in a narrowing of the subwoofer's useful passband. A software tool like Hornresp can be used to model the enclosure and determine what impact those resonances are going to have on its response. The issue of long vents and those resonances is why I tend to look at using offset TLs rather than simple vented enclosures for subwoofer duty now. Thanks Brian. I DL'd hornresp a while back, but it looked pretty intimidating. Bill, thanks again. You said full power, so I didn't guess you'd mean half RMS. I have seen some recommendations for keeping vent velocity to below 10 m/s, so at 150 watts I'm still over 12. I may look into yet another redesign if you think pipe resonances might be a problem. Heh, I thought you'd give me hell letting the peak power vent velocity get above 20! Also, any thoughts on the bracing? Should I make something more robust? By full power I should have been more specific as 1/2 RMS, to allow for some headroom. I'd say that's adequate bracing. ... Also the log-out timer on this site is set to like a minute, which is worse than my bank! Holy crap! The forum s/w doesn't recognize user activity when you're posting (s/w bug). So, when you log in, check the box that says "keep me logged in". and you won't get timed out when posting. 280w or even a 3" round (flared on both ends) port 10"-15". the tuning easily to find the sweet spot. If in doubt use 4" round. How bad is what I have right now: 1.1cu ft., 27hz, port 0.8" x 12.5" x 30.4" I've attached the WinISD project. The weak points I'm aware of right now are the frequency response not being perfectly flat, and the port velocity. If I go with a smaller box, I flatten the response, but I lose a little low-end response and port length isn't convenient. A larger box makes for more port options, but the response hump gets worse. As it is, there's about a 1.3dB swing from 30hz to the 45hz area. Is it true that response humps get better when there are multiple boxes? This setup will have a pair, and possibly an additional two, later. Port velocity is 21.34 m/s peak at 150 watts. If I choose a larger port opening, it gets inconveniently longer and I have to add another bend. If I go significantly larger, the 1st port resonance gets uncomfortably low. When you try to force the design, rather than let the design determine the size of the box, there are going to be unavoidable compromises. 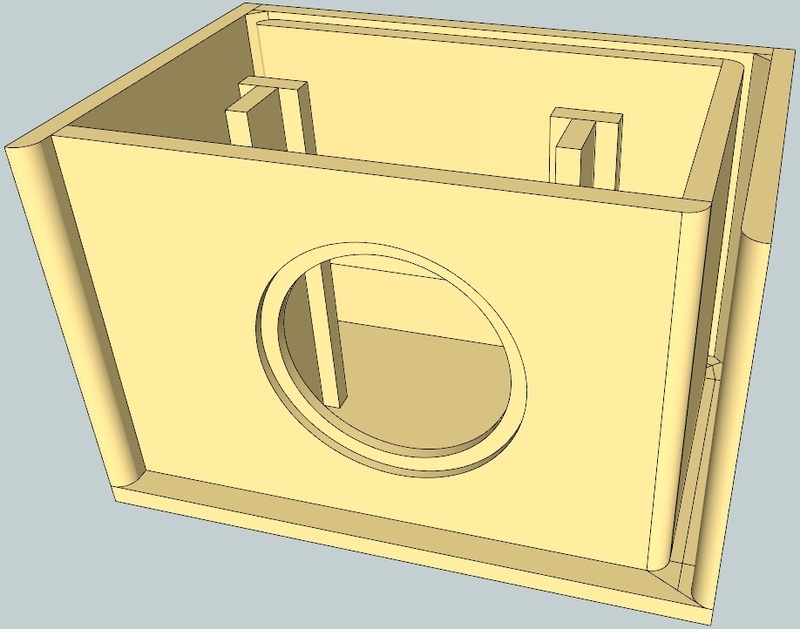 For a no compromise result find the net box size and tuning that gives the desired result, size the duct area for the desired result, then make the gross box size whatever it needs to be. think about keeping the same (10sq.in.) cross-sectional area VS the length of the perimeter around that X-sect. area. 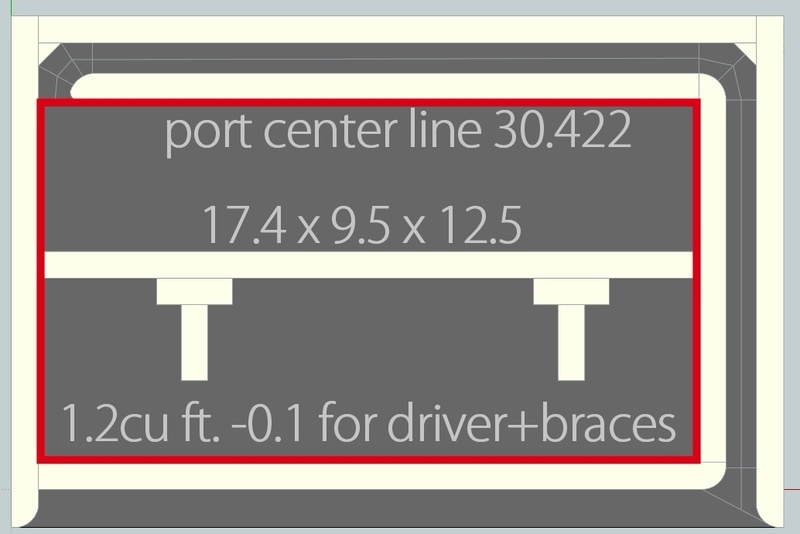 Going down the "list": the 2.5"x4" slot has a perimeter of 13" (2h + 2w), the 2x5 is 14", 1x10 = 22", YOUR 0.8x12.5 = 26.6", whereas the round port is only about 11-1/4" (the LOWest)! The "chuffing" is caused by the air dragging along the side wall (and interactions w/regard to the turbulence at the vent end). Your extremely short (but wide) slot is WAAY more prone to chuffing than a round port of the same X-sect. area. It MIGHT end up being OK, but personally, I'd shoot for a width more in the 1-1/4" to 1-1/2" range. Some will say that the extra "drag" will even affect the resultant tuning frequency. The slot was more attractive, but I didn't consider the perimeter length. Ok. 2x5. How bad is having two bends like that? I figure I was sorta already having two bends before, with the opening in the corner. No problem. I wouldn't bother w/the "45" corners. Here's an old (HiVi) SP10 in about a 0.85cf (net) box w/about a 55" long (1.25" x 10.5"? - or so) slot. Worked fine.